Moscow, November 28, Interfax – Patriarch Kirill and Pope Francis could meet but only after issues in the relations between the two churches are resolved, the Moscow Patriarchate Department for External Church Relations said. 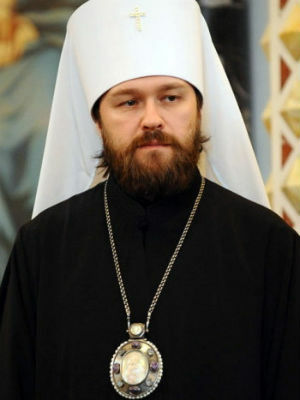 The unresolved conflict between the Orthodox and Greek Catholics in Ukraine remains the main obstacle – almost all churches were taken from the Moscow Patriarchate during the revival of the Ukrainian Greek Catholic Church in Western Ukraine in late 80s, Metropolitan Hilarion of Volokolamsk, Chairman of the Department for External Church Relations, said in an interview with the Le Figaro newspaper. According to Metropolitan Hilarion, the Ukrainian Orthodox Church has difficulties when building churches in western regions of Ukraine. At the same time, the mission of the Ukrainian Greek Catholic Church is expanding in traditionally orthodox lands in Eastern and Southern Ukraine, which concerns the Orthodox. As to the place, time and various protocol details of the meeting between Patriarch Kirill and the Pope, such a discussion was not held bilaterally for now, Metropolitan Hilarion said. The Russian Orthodox Church shares the stance of Pope Francis on many issues, Metropolitan Hilarion said. Even prior to being elected as the Pope, Cardinal Jorge Mario Bergoglio showed his deep liking of the Russian Orthodox Church and his wish of close contact with it, he said. Metropolitan Hilarion said that he met with the Pope during the enthronement celebrations in the Vatican and that the Pope confirmed back then the intention to assist the two churches reaching an understanding. The second meeting in November showed that the Russian Orthodox Church and the Pope have similar stances on many modern issues, he said. Both Churches can develop cooperation in resisting decriminalization of Christian and defending Christian values in the modern secular society, including the standards of traditional family ethics, Metropolitan Hilarion said.